Search for the best flight prices from Manchester to Cairo. Compare prices, book today and save money with Manchester Airport. 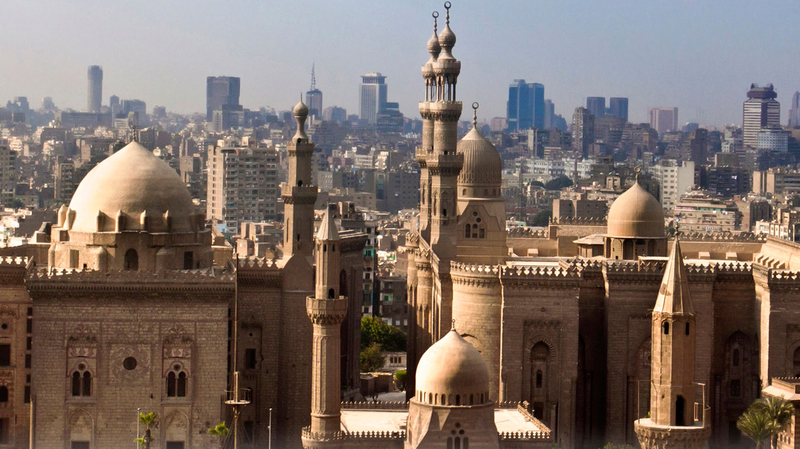 The Egyptian capital might be famous for its pyramids but there’s much more to Cairo than ancient monuments. Cairo is the city that never seems to sleep but you'll have no problem finding a bed. Five-star hotels congregate Nile-side, while more modest options are scattered throughout Downtown. The landmark Cairo Marriott (16 Saray al-Gezira Street) in Zamalek has a peaceful garden setting and opulent Moorish foyer, while Mena House Hotel (al-Ahram Road) has the pyramids right on its doorstep. On a more modest budget, the minimalist Scandinavian-style of Hotel Royal (Elwy Road) is a cosy and comfortable choice. There is no shortage of budget beds in Cairo but Freedom Hotel (6 Bank Misr Street) and Hostel Luna (27 Talaat Harb Street) have solid reputations for safe, clean rooms and friendly staff. From delicate calligraphy etched into metalwork to plastic pyramids and singing camels, Cairo has shopping for every taste and budget. The most atmospheric place to shop is the sprawl of alleyways known as Khan el-Khalili in Islamic Cairo. Here, antiques and art, T-shirts and tat, gorgeous handmade lamps and bowls and Bedouin textiles all compete for your attention. Bargaining is the name of the game, and if you don't want to play you'll miss half the fun. For high-quality products without the market hassle, Zamalek is the district to check out. In particular Nomad (14 Saray al-Gezira Road) and Fair Trade Egypt (27 Yehia Ibrahim) stock beautiful handcrafted goods. Even the fanciest restaurants in Cairo offer astoundingly good value for visitors. The hippest places to eat are in Zamalek. Dine in style with a Mediterranean-inspired menu at La Bodega (157 26th of July Street) or dig into some of the city's best pasta at funky La Mezzaluna (Aziz Osman Road). It's also worth the taxi ride out to Al-Azhar Park in Islamic Cairo for the Middle Eastern feasts of Citadel View (Salah Salem Road). Downtown is packed with hole-in-the-wall places churning out meals of falafel and kebab for a few pounds. Don't miss digging into rustic Egyptian flavours at Fasahat Soumaya (15 Youssef al-Guindi Road). A Sufi celebration remembering the birthday of the Prophet Muhammad's grandson, this festival takes place beside the Mosque of al-Hussein and attracts massive crowds. Ramadan (the Muslim month of fasting) is Islam's most holy month but it's also a time of celebration. By day the city sleeps, but every evening the post-fast party bursts out across the streets of Downtown. It's Cairo at its most atmospheric. A brilliant mishmash of experimental theatre hosted at venues across Cairo. The program boasts productions from across the Arab world and Europe, as well as home-grown talent. This 10-day event hosts some of the Arab world's biggest names in classical and traditional music at the Cairo Opera House. The only chance Cairene cinema-goers get to see uncensored movies on the big screen. This 10-day event screens the latest releases from across the world.